I am much of a Cavite citizen as I am a Pangasinense these days, since the husband started working in Cavite City in October last year. The family often tries to spend weekends there, and we actually spent our first Christmas out of Pangasinan in the city of three bays. Of course any new place brings the thrill of new, local food. And what has Cavite to offer along these lines? Apart from the original Digman halohalo (which I still have to see and taste)? Of course it's fresh tahong (mussels) and talaba (oysters), heaped still dripping on tables lining Coastal Road all the way to Sangley Point. At Php40 per overflowing tabo (a large can), mussels have become the family's cheap and nutritious weekend staple. The tahong from Cavite City are especially large and luscious, tastier than those harvested in towns nearer the metropolis. I guess cleaner waters have much to answer to this discrepancy. So as not to suffer burnout from the usual tahong tinola, every weekend I try to rack my brains for other ways of cooking mussels. Especially since we haven't gotten over our tahong phase yet - the talaba phase still has to start (but then we prefer our own succulent Pangasinan talaba, cultured in Dagupan City). But tahong are tasty on their own, needing not much else. I've tried baked mussels - a mixture of softened butter, grated cheese, crushed garlic and salt and pepper spooned over mussels on the shell that have previously opened by a few minutes of steaming, then grilled or baked on high until topping has melted and browned a little, about 5-10 minutes. 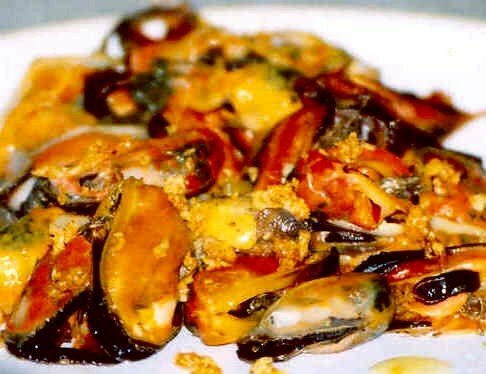 In this version, the mussels benefit from the condiments because the juices invariably drip to the steaming water (making it ideal to make into soup - the tinola with vegetables but without the mussel meat), with the mussels turning a bit bland so that they need a little enhancement. And then I remembered an uncle who just grills tahong - unopened shells tossed over live coals until they open. It was an easier and more economical way, removing the steaming part. So I tried that out one weekend, with the happy thought that the mussels cooking in their own juices would turn up tastier meats. How right I was! They were the most intensely flavored mussels I've ever eaten, concentrations of taste hitting you with every succulent bite. They came in such robust colors, too. I first planned on spooning my usual baked tahong butter-cheese-garlic mixture on each shell as it opened and grill for a few minutes, but thought better and let them be. Good thing I did, for the mussels would not have tasted better than on their own. For the next batch I removed the grilled mussels from the shells and poured over melted butter and fried minced garlic, my favorite enhancers to steamed white fish. But the butter and garlic flavors drowned in the commanding taste of the grilled tahong, powerfully emphasizing (screaming, actually) that they do not need anything else. The better for me. Minimal preparation and cooking. Minimal saturated fats, too. Another tahong dish I've been making I learned from a former supervisor at work, who cooks tahong as her husband's TV viewing pica-pica, or even pulutan. 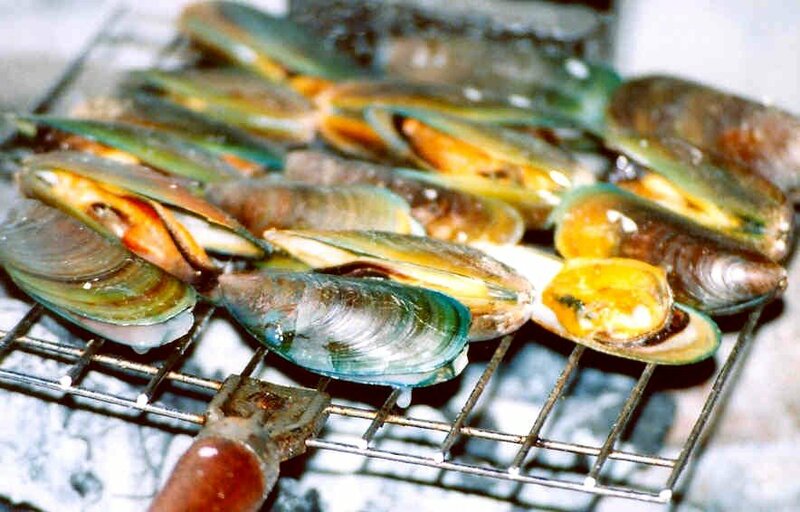 It involves the previously-steamed mussels taken out of the shell, coated with a batter mixture of a beaten egg, flour, cornstarch and salt and pepper, then fried to a crisp. The frying process, albeit increasing the fat content, also adds back flavor. I add a bit of my favorite (obvious by now) Old Bay seasoning to the batter for a bit of spice. The version above, made by the househelp, had a watery batter, so did not cover the mussels much, turning them a bit chewy. 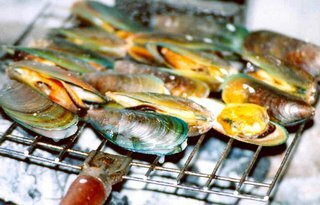 A thicker batter (more flour) would preserve the mussels' succulence. So to share some easy dishes for those going meatless this week. Be warned, though, as these have such deep flavors, I have found that they are very rice intensive. hi kai! with ur tahong recipes for holy week abstinence wouldn't be much of a sacrifice. Iska, wala ba tahong sa China? Yo, haha, yeah you're right! Oh wow! Sarrrrap. I haven't tried grilled tahong. :) And I like what you said in the bottom text bar -- letting your senses to the tasting. Beautiful! I wrote a poem once on letting senses lead your cooking. I totally buy into this idea! kalad, you got me missing the adobong tahong with just the right combination of sourness, soy and black pepper rocky's father who is a true blue caviteno prepares for us when he was still alive. this adobong tahong is truly a labor of love, steamed just so it can be coaxed out of its shells, the tahong meat gathered and then cooked into adobo. you won't be bothered with the shells, just savor the flesh and contentment of this real comfort food. Kalad, I didn't know Rocky's father had already died. I miss his adobong tahong, too. I try to approximate his, but mine always comes short. 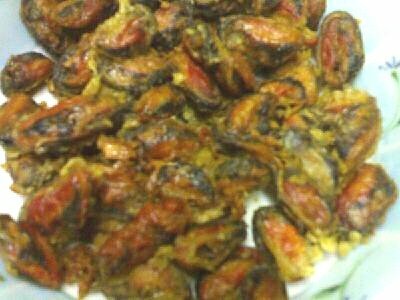 you can try my family's recipe tahong "bbq". (for a kilo)wash mussels well, scrub outer shells. steam open. discard half shell. in a wok, saute in oil a lot of chopped garlic till golden. add in the mussels in half shell. pour in about 2-3 ladles of soy sauce, equal measure of brown sugar, chopped red and green sili, juice from 3 calamansi, a little water. let boil and stir around the mussels continuously. they sauce should thicken and coat each mussel shell. the reason why i make sure the shells are cleaned well is because you will tend to lick off the coating from the shell after you eat the meat. Thanks to whoever shared that recipe for barbecued tahong. I will make some this weekend! You are all so inspiring and sort of brings me back to the Philippines that we all love. I will certainly get me a box of tahong from the local supermarket and give the recipes a try. They all sound good.